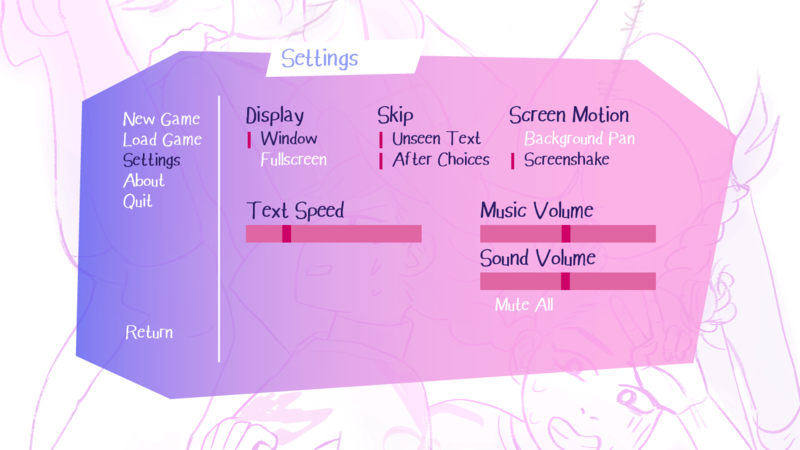 In the newest build of the game (1.9), you can now toggle Screenshake and BG Panning at any time! In the game, just go to Settings (the gear icon) and then Screen Motion. This was a highly requested feature since many players got motion sickness or found them disorienting. Thanks Arazati for helping me with this! You might've gotten notifications multiple times for this because I accidentally messed up the credits the first time and had to re-upload it. Sorry for the confusion! Next up, I'm aiming to get an online merch shop running by the end of the year. I want to sell Butterfly Soup and Pom Gets Wi-Fi charms and hopefully apparel like Diya's hoodie! OMG I JUST FINISHED THE GAME. THANKS FOR MAKING IT. I WENT CRAZY WITH THE POMERANIAN NAMED POM. LOVE U. AND DIYAXMIN. I'M HIPED FOR THE MERCH.